When Nicola Gordon and her younger sisters travel from India to England, she goes to a marriage she doesn’t want.Drew Barlow has no desire for marriage, but his distant cousin and Nicola’s grandfather, ran the estates into debt. 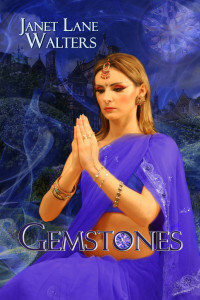 Drew agrees to the marriage for the money and to please the Dowager, Nicola’s grandmother, but he has no trust for women or for love.When the two meet they clash and come together, igniting a blazing attraction they cannot resist.Janet Lane Walter’s latest book Gemstones is a stunning tale of the differences between two cultures, English and Indian, and what occurs when two different cultures clash. After the death of her father, eldest daughter Nicola Gordon must take charge of her family, fifteen-year-old Elizabeth, a budding flirt, and ten year old Margaret, a hoyden of the worst degree.